You can find the Virginia Chutney Company in the blue hills in Virginia and making chutney is their passion. 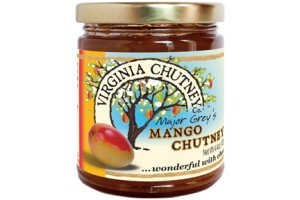 The Major Grey's Mango Chutney; a traditional chutney pairs well with aged cheddar and Gouda cheese. It has a third the salt than most mango chutneys and more ginger and cinnamon. Try it as part of your glaze for grilled chicken and turkey or shrimp and fish. Ingredients:mango, pure can sugar, ginger, vinegar, salt, raisins, garlic, lime juice, cloves, cinnamon.